Last week, I was chatting about garden sheds, which you can read more about by clicking here. Bitten by the ‘outdoor building’ bug and also somewhat inspired by Kevin McCloud’s cabin in the woods in his ‘Man-Made Home’ programme, I’ve been taking a look at log cabins. Log cabins have long conjured up images of rural retreats; calm buildings for getting away from it all. However, you don’t need to escape into the woods to retreat into a beautiful wooden oasis. With more and more people opting for a work-life balance, working from home or setting up your own business is becoming more prevalent; yet fitting an existing office space into your home can be difficult. However, log cabins are being increasingly used for home offices! 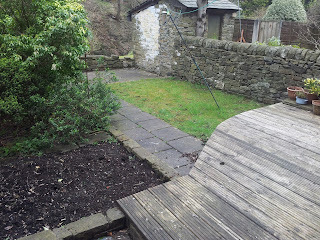 My friend works from home and the log cabin at the bottom of his garden is not only an office, but a quiet retreat from the hum and din of everyday life that carries on only a few metres away! This Greenacre Home Office is a great example of the sort of log cabin that can be used as an office. Conversely, log cabins can also be a place where work, and indeed, the stressed and strains of modern life, are left far behind. I love the thought of this ‘zen log cabin’, which also provides a sheltered outdoor area – perfect to plant some pots of flowers or even train those vegetables! If you’ve been considering making more use of your garden space and feel like something bigger and more homely than a shed, a log cabin can not only provide you with a space that’s unique, comforting and natural, but can also, in effect, add another room to your home. Take a look at the full range of log cabins available from Waltons. Whilst gardening as a pastime is its own reward – a timeless, peaceful and enjoyable communion with nature – there are many different 'thrills' that the modern gardener encounters throughout the year; and none as special as seeing seeds sprout for the first time. Last weekend was very much about laying the groundwork for the summer ahead – literally. 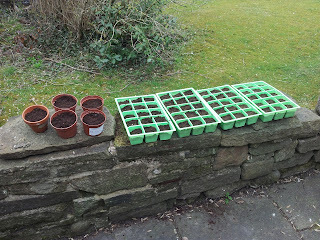 Having cleared the garden and sorted out the shed, I spent a long afternoon in the shed potting up flowers and planting various vegetable seeds (you can read last weekend's post by clicking here). However, this weekend I have experienced my first genuine 'agricultural thrill' of 2013, when I noticed that my cauliflower and cabbage seedlings had sprouted! You may recall that in last weekend's post, I had noted that I had never previously attempted to grow these two vegetables before, so this sprouting was made all the more exciting. 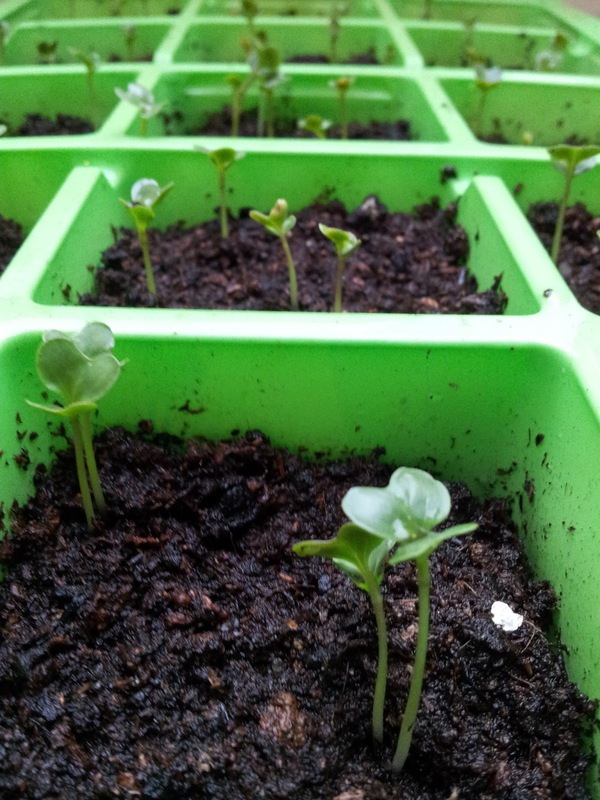 In my five years of experience, I have found that, for the urban gardener, germinating seeds is often one of the most challenging of tasks. 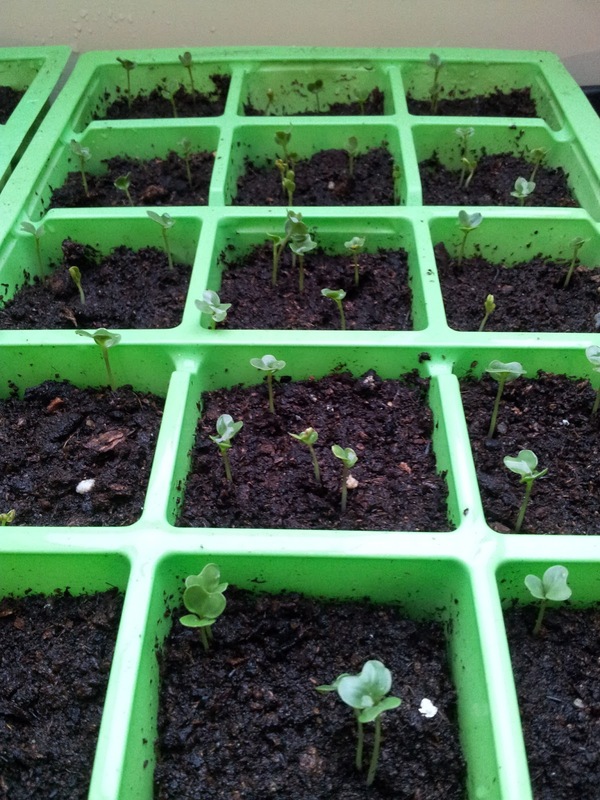 Vegetable seedlings are often very delicate, and compost in small pots and trays is liable to dry out quickly: yet at the same time, it's also easy to over-water them. 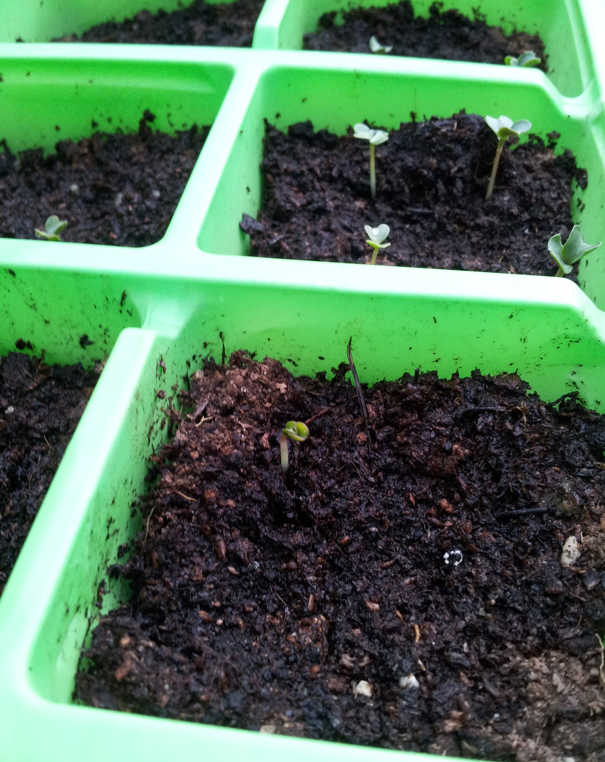 So it is always a small victory to see young vegetable seeds pushing up through the compost and into the world; their green shoots contrasting with the black soil you have been staring at for days when watering your pots and trays. I also feel that there is a genuine connection between gardener and plant. Whilst I'm not adverse to buying in plants, flowers, shrubs and so forth, I feel very differently when it comes to vegetables and flowers that I have grown from seed. There is such a personal connection with that plant; such a passion, borne out of diligence and care, right from the very beginning of that plant's life. I have carefully potted up a flower pot or tray; I have carefully opened the seed packet and covered the seeds with a bed of compost. 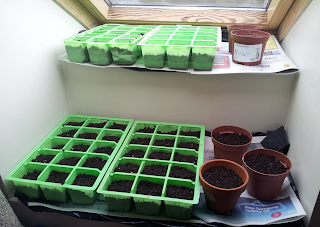 I have placed those trays and pots in a warm, light place; watered them; checked on them. It's a very personal thing. So for me, this weekend's progress is a special moment, experienced once every year. And this is a feeling that anyone can experience, regardless of space or experience. I'm hoping to plant my vegetables out in the garden of my Peak District cottage this year; but will be growing plenty of these young vegetable plants in containers, pots and windowsills, to demonstrate that no matter who you are or where you live, YOU CAN GROW YOUR OWN! It's a wonderful feeling to see seeds that you have nurtured grow into thriving plants that bear wonderful vegetables from the garden: and I sincerely hope that my blog posts can help you to capture this feeling and inspire you to have a go! Look out for Wednesday's post, in which I'll take you through my do's and don'ts for vegetable seedlings! 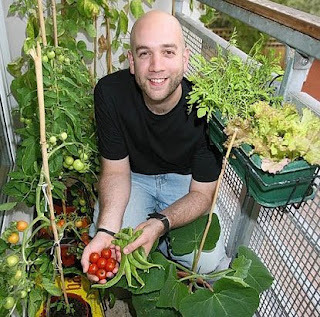 In the meantime, feel free to drop by and have a chat with me on Twitter, @londonveggarden. If an Englishman’s home is his castle, then what does that make his shed? Although my cottage garden is a modest size, I love the fact that it has a lovely little shed tucked away at the bottom. For many people, a shed is simply a place to park the mowing machine, store tins of paint and collect cobwebs – but a shed can actually be so much more! In my shed, I have a table set up especially to use for various gardening jobs, from planting seeds to re-potting flowers and plants. But sheds do not just have to be functional: they can also be an enjoyable place to relax and escape from it all! I can often be found sat in my shed, with the door open onto the garden, enjoying a cup of tea and reading my gardening books. For many of us, a shed is a dream; an escape from the noise of the world and a place where we can go and be closer to the garden and the outside world. 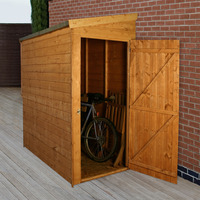 However, you may also need a shed just as a place to store a bike and some gardening tools. Luckily there are a wide variety of sheds available and even better, they’re not as expensive as you may think! The ‘classic’ shed, an apex shed offers room for shelves, maybe a potting table and also place to store your tools and equipment. 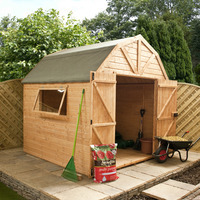 This particular design is less than £200 from Shed Supermarket and offers gardeners the classic shed to start off with. Pent sheds are tall and narrow – ideal for the side of a house and for storing things like cycles and tools, creating a space to keep things safely. This Dutchbarn shed is an absolute dream! Packed full of space for all sorts of things, this is more like a secret cave to hide away in – perhaps you could even fit a couple of chairs in, next to a pile of well-read gardening books. 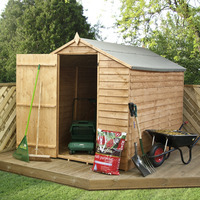 So if you’ve been thinking of getting a shed for your garden, why not take a look at Shed Supermarket? There are sheds of all shapes and sizes at competitive prices. Happy shed hunting! Quite simply, I love pots and planters. When I started the London Vegetable Garden on my Hackney balcony, it was imperative to make good use of containers: gardening in the air, on concrete, necessitated it! However, even though I now have the luxury of a garden in my Peak District cottage, I’m still a huge advocate of containers and pots, for the simple reason that they offer the gardener a great deal of flexibility. On the rare occasions that sunshine actually does fall on the British Isles, it’s essential to make the most of it! 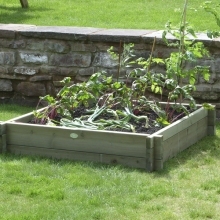 Planting vegetables in wooden garden planters such as those available at UK Water Features allows gardeners to move plants around as required to make maximum use of the weather. 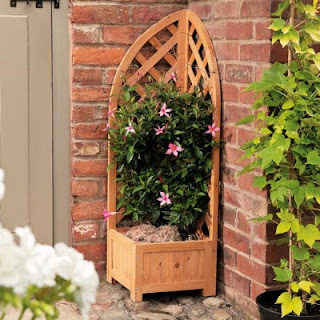 Planting in wooden garden planters allows you to freely move your vegetables around without disturbing the roots – which is vital to ensure the plants remain happy and healthy! Whilst plastic flowerpots are cheap and readily available, they are not the most picturesque of garden sights! Using wooden garden planters in the garden is far more aesthetically-pleasing, whilst the variety of colours available ensure that gardeners can apply a personal touch, as well as ensuring that their pots and planters fit in around the garden! And of course, wooden planters can allow budding gardeners to create planting areas when space may be limited or actual earth is not available! Patios, driveways, paved areas: planters and pots allow you to create an environment for planting all kinds of vegetables and plants. 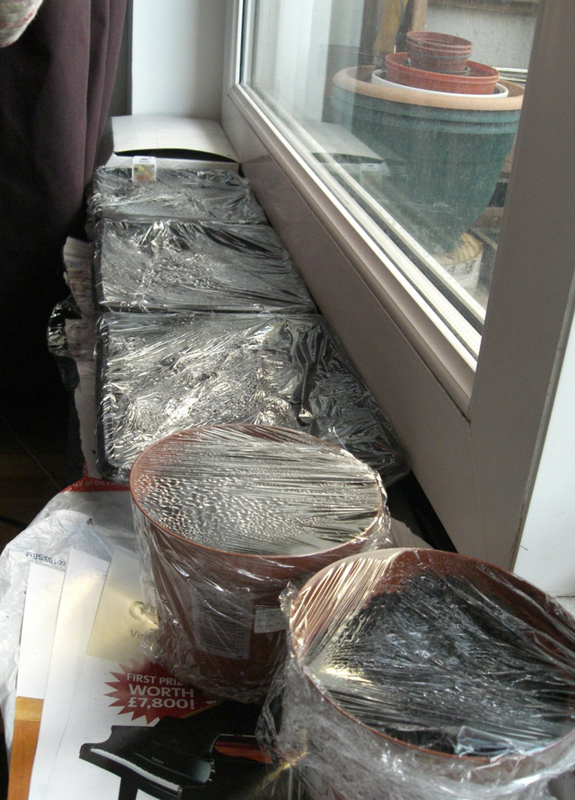 When I started the London Vegetable Garden blog on my balcony, I would have been lost without pots and planters! 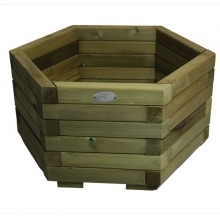 My friends at UK Water Features have a huge range of wooden pots and planters, demonstrating the impressive range of products on the market today. 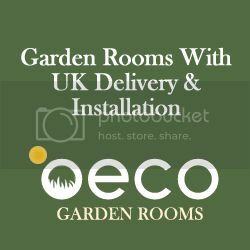 Whether you’re looking for a convenient pot or planter to grow tomatoes in, a raised planter for serious vegetable gardening, or an elegant design to place some ornamental plants in, there really is something for everyone! 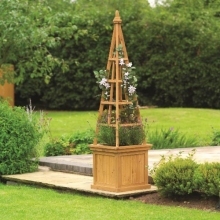 To see the full range of wooden garden planters, please visit the UK Water Features website today! With drizzle falling from the skies, I donned some old gardening clothes, made a fresh mug of tea and ventured into the garden with a steely determination: it's that time of year when every gardener has to tackle the shed! 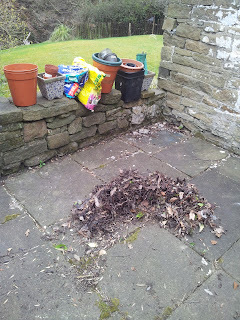 Sometime back in October, I packed up all of the old flowerpots, put the barbecue away and shut the shed up over what has been a very long and cold winter. However, spring has arrived in many parts of England and although the Peak District (current home of the 'London' Vegetable Garden) remains under grey skies and odd showers, it has started to get warmer in the garden. As you can see, the decking area at the foreground of the picture allows for plenty of pots and containers, as does the paved area at the bottom of the garden. 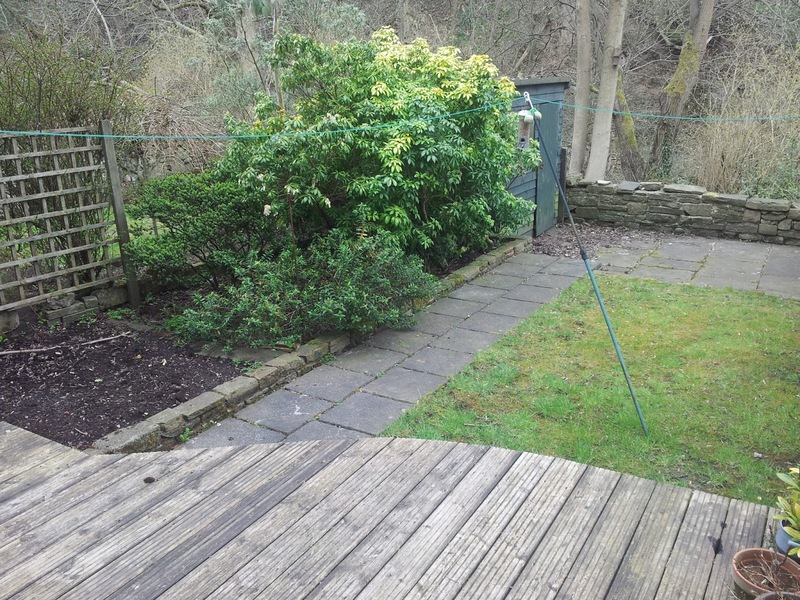 The bed of soil on the left of the pictures is cleared for vegetable growing, however I found last year that this patch was quite shaded and often very damp: I am currently researching the best vegetables and plants to grow in this shaded, damp vegetable patch. Following the clear-out of the shed and the tidying up of the garden, I set about planting various vegetable seeds in trays. These included proven staples such as tomatoes, cucumbers and runner beans, whilst sweet peppers, cauliflower and cabbages are all a first for the London Vegetable Garden! 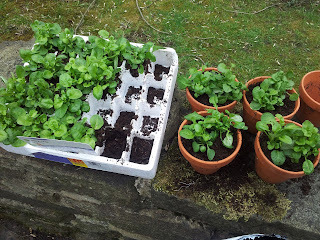 In addition to the vegetable seeds, I also potted up some trailing lobelia, which my wife and I had purchased earlier in the morning from B&Q. We bought 24 plants for £5, which I have potted into various different flower pots and containers at both the front and the back of our cottage. I can't wait until they start to bloom and bring great swathes of colour to our windowsills and patio! So that was a very eventful Sunday in the garden, but one that ultimately indicates that the vegetable garden is very much up and running for summer 2013 – let's hope it's a productive one! 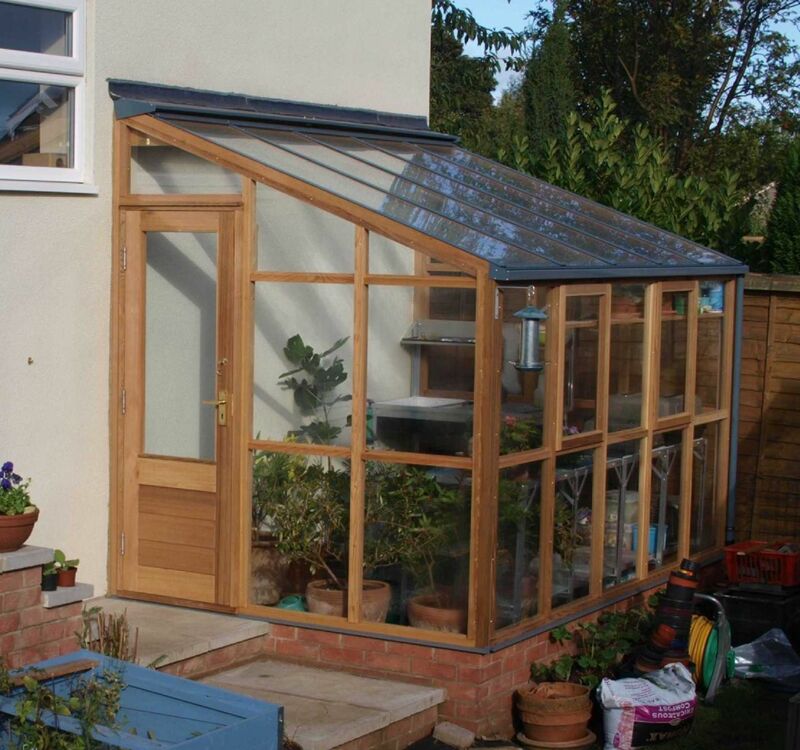 Look out for my next blog post on Wednesday, when I'll be discussing how to maximise your window areas to create DIY greenhouses for your vegetable seeds! Until then, come and say hello on Twitter, @londonveggarden, or come and join the community of like-minded urban gardeners on Facebook! 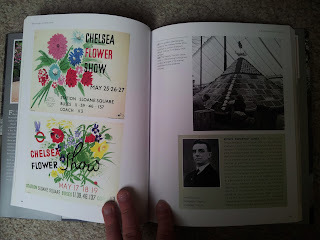 This weekend, I reviewed the wonderful 'RHS Chelsea Flower Show: A Centenary Celebration', by Dr Brent Elliott, a delightful book celebrating 100 years of this iconic gardening event. In addition to the exclusive discount offer for readers of the London Vegetable Garden (see the post here for details), the lovely folk at Frances Lincoln Limited publishers have a brand new copy to give away to one lucky reader of the London Vegetable Garden! 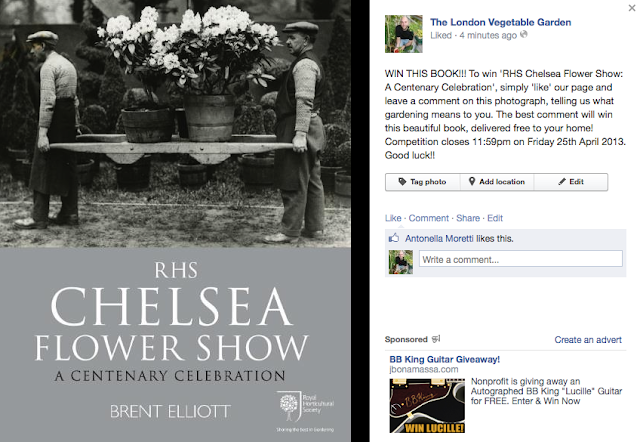 To enter, simply click on this link to be taken to the book photograph on the London Vegetable Garden Facebook page. To win, write a short comment explaining what gardening means to you! The best comment will receive a brand new copy of 'RHS Chelsea Flower Show: A Centenary Celebration', delivered free to their home. Good luck – and remember to 'like' us on Facebook! 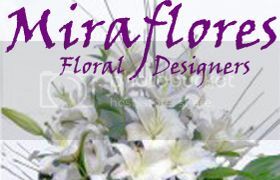 One of the things that I love most about gardening, plants and flowers, is the very timelessness of it all. In a world of high-speed technology and global industrialisation, it's reassuring to spend some quiet time in the garden, nurturing and cultivating plants with knowledge that has been passed down through generations. And this sense of gardening through time is explored marvellously in the new book from the Royal Horticultural Society, which celebrates the centenary of the Chelsea Flower Show. 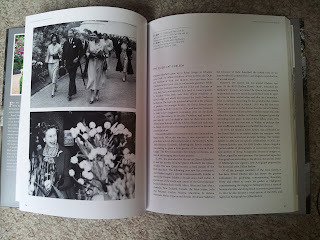 Written by Dr Brent Elliott, librarian and archivist to the Royal Horticultural Society and author of numerous articles and books, 'RHS Chelsea Flower Show: A Centenary Celebration' is a veritable 'joie de vivre' of gardening literature. 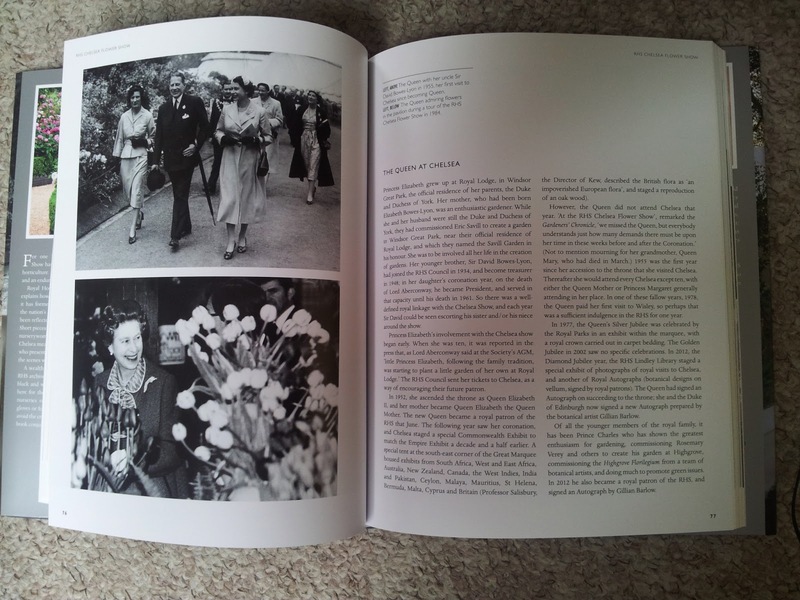 Packed full of rare archive photos, content and interviews, this wonderful book explores the history of the Chelsea Flower Show, charting its progress from humble beginnings to the war years; populism in the 1960s through to the media glare of the 1990s and the ascendancy of style in today's culture. On page 80, we see some truly stunning photographs of vegetable exhibitions, which will no doubt appeal to readers of the London Vegetable Garden. Of particular fascination throughout the book is also the many vintage posters and signs, which demonstrate our collective attitude towards gardening from a societal perspective; from the austerity of post-war gardening, to the flamboyance of competition and modern-day artistic creations. 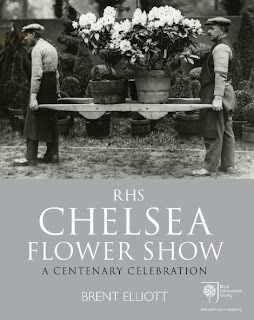 Published by Frances Lincoln Limited, 'RHS Chelsea Flower Show: A Centenary Celebration' is available now in all good book shops, priced at £25. EXCLUSIVE LONDON VEGETABLE GARDEN READER OFFER! To order 'RHS Chelsea Flower Show: A Centenary Celebration' (9780711234512) at the special London Vegetable Garden offer price of £20.00 (inclusive of UK P&P) please call Bookpoint on 01235 400400 and quote the code 46CFS.